I purchased this quilt from the Santa Fe craigslist. By the time I spied the $75 listing, it had been live for more than 30 days. The seller said she got it from a friend’s thrift store in Los Angeles. “It’s really old,” she said. Yes, it is. I’ve always heard these sorts of quilts referred to as friendship quilts, they are quite common and have a long history. 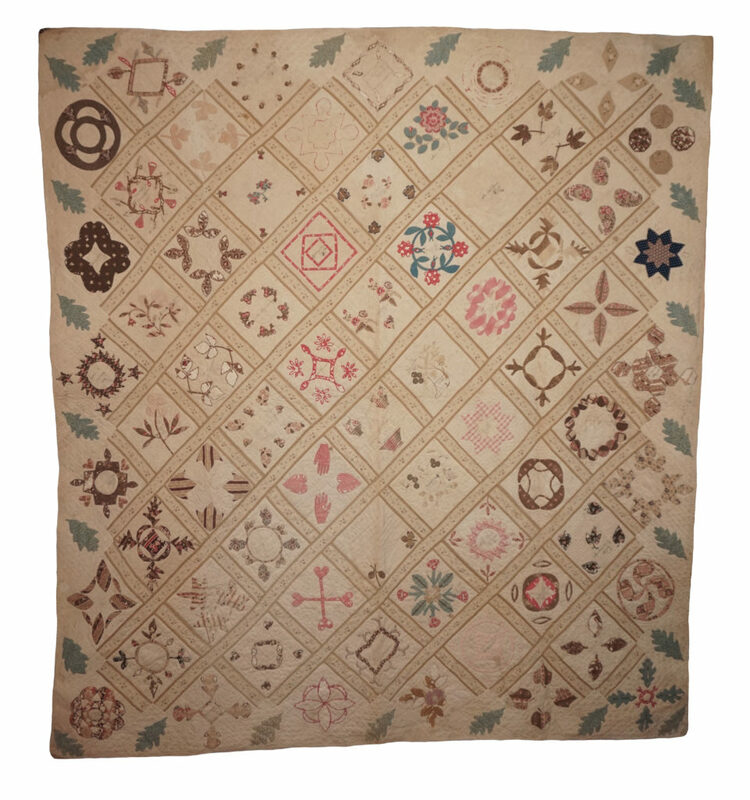 This quilt is an example of the very earliest, they were all the rage in the 1840s and referred to then as album quilts. In American Quilts: The Democratic Art, Bob Shaw titles Chapter 3 “The Golden Age of Applique”, 1840-1860. Shaw notes that block-style construction had just begun to overtake the European approach of building a quilt around a central medallion. 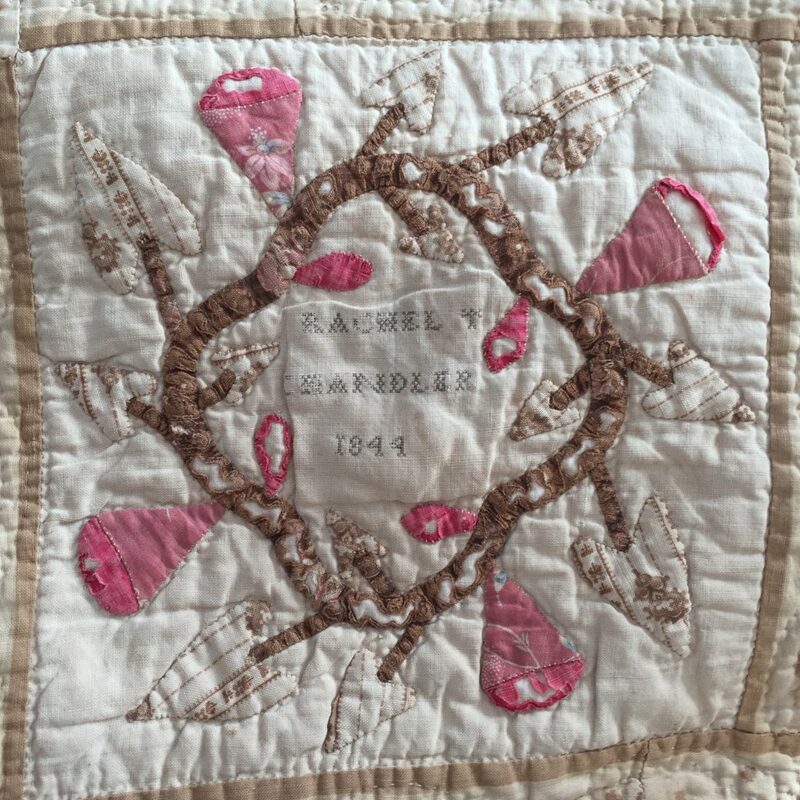 “Sampler quilts first became popular in the 1840s, just as block-style design began to overtake the central medallion format as the dominant organizational method employed by American quiltmakers,” Shaw writes about quilts in which each block is a different design. 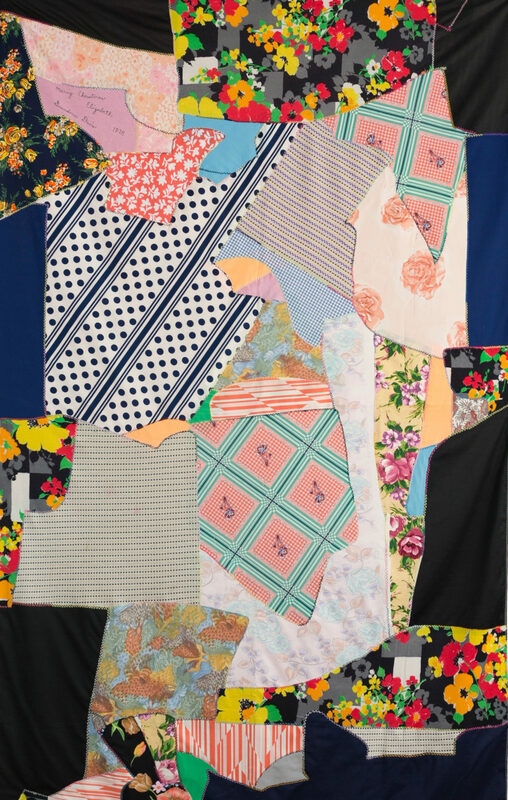 Shaw discusses Album quilts as made and signed by groups of women to give to a departing friend, or perhaps a minister leaving their church, as a common practice. “America was on the move in those years,” he writes, noting that three and a half million Europeans migrated to the United States between 1825 and 1900. Searching the names I can make out on this quilt online at ancestry.org, it’s very possible that many of these women were born in England. 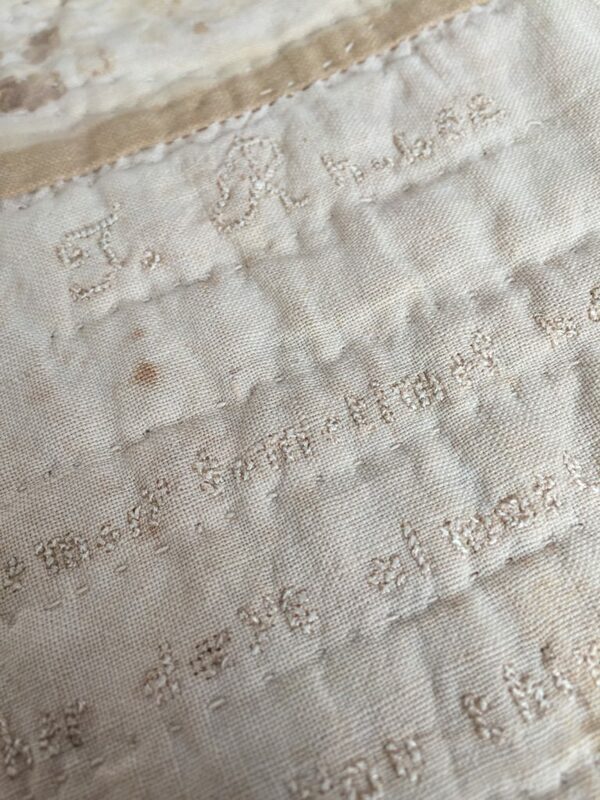 There’s a “forget me not” poem embroidered on one of the blocks. It’s very hard to make out who it’s to or from. But by deciphering just a few phrases I was able to find it through an online search. Let memory sometimes bear thee back, To other days almost forgot; And when you think of other friends, Who love thee well–Forget me not. 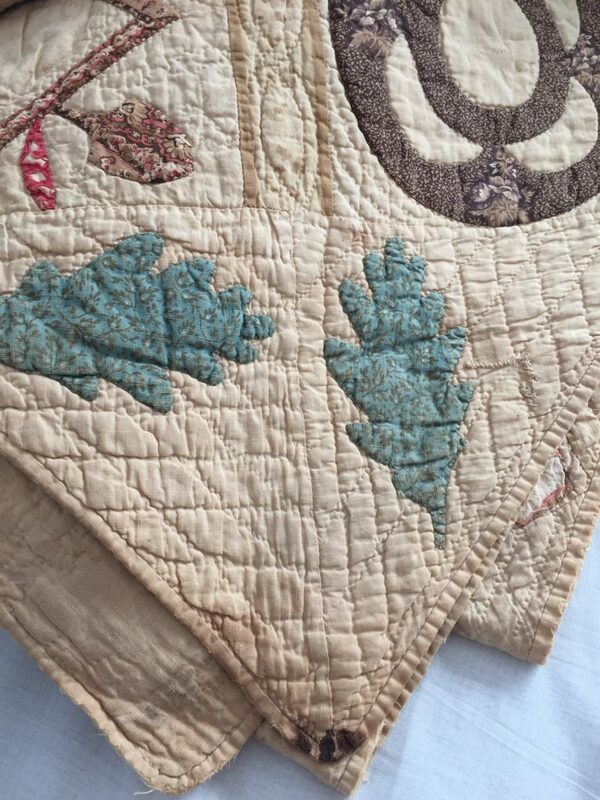 Who knows where this quilt traveled in the 173 years before it landed in Albuquerque, New Mexico. 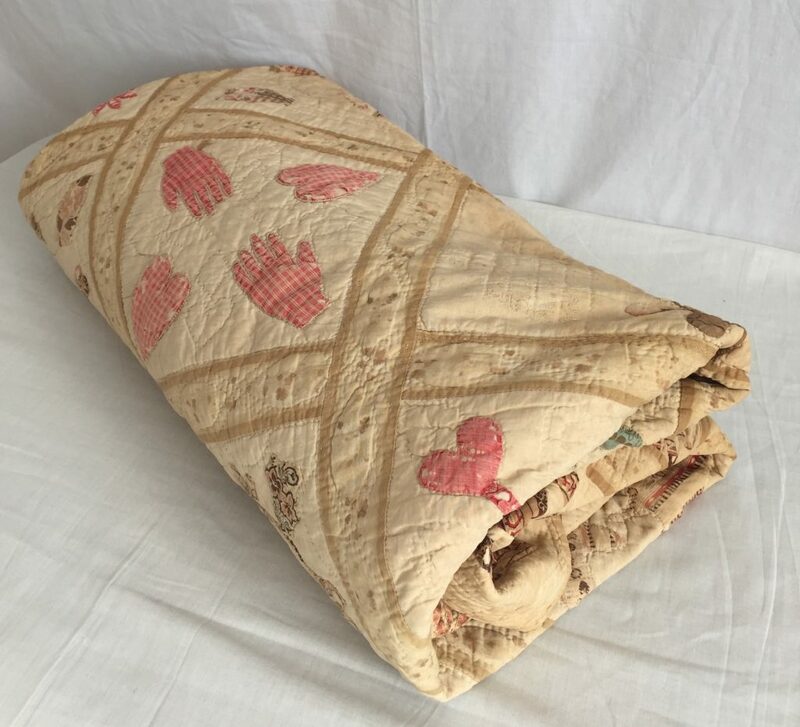 The fabric has that aged “tea” look that you see done on purpose these days in reproduction quilts and other fabric items made to decorate homes. But in this quilt, it’s the real deal. 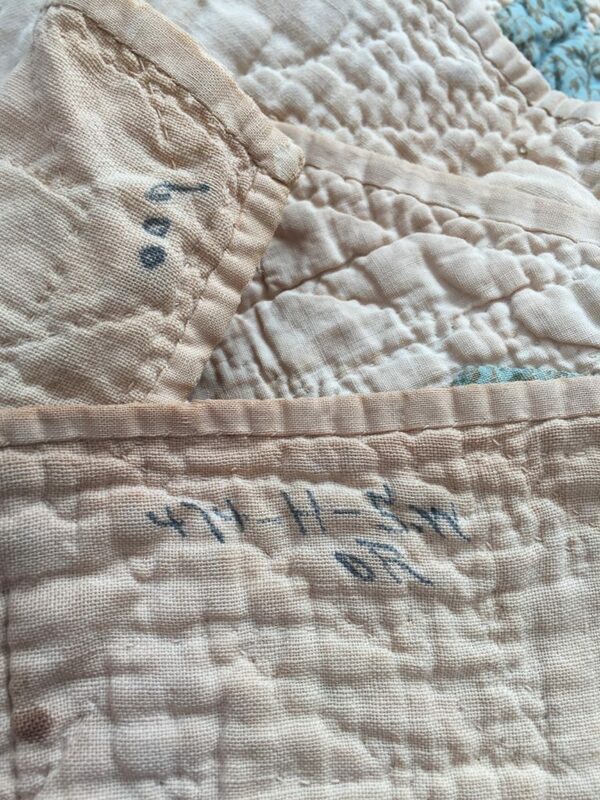 The quilt is full of signatures in ink, most of them so smudged that it’s very hard to make them out. 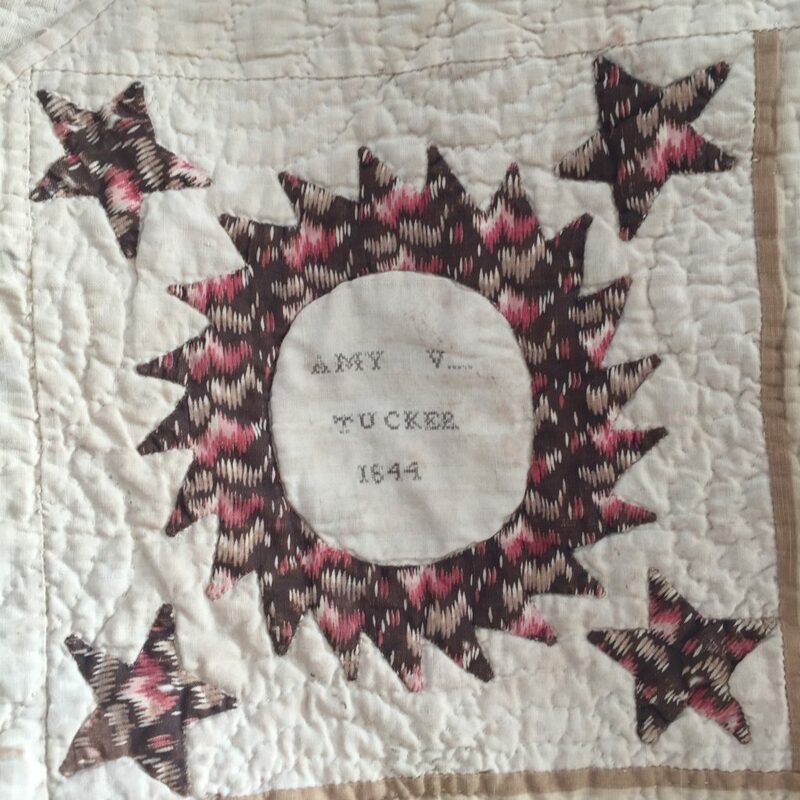 But thanks to Amy Tucker and Rachel Chandler, we know that the quilt was made in 1844. There are also a few place names in ink that are just on the edge of decipherable. While there’s quite a bit of fabric loss, there’s still a lot to enjoy as well. There are numbers in ink on the back. 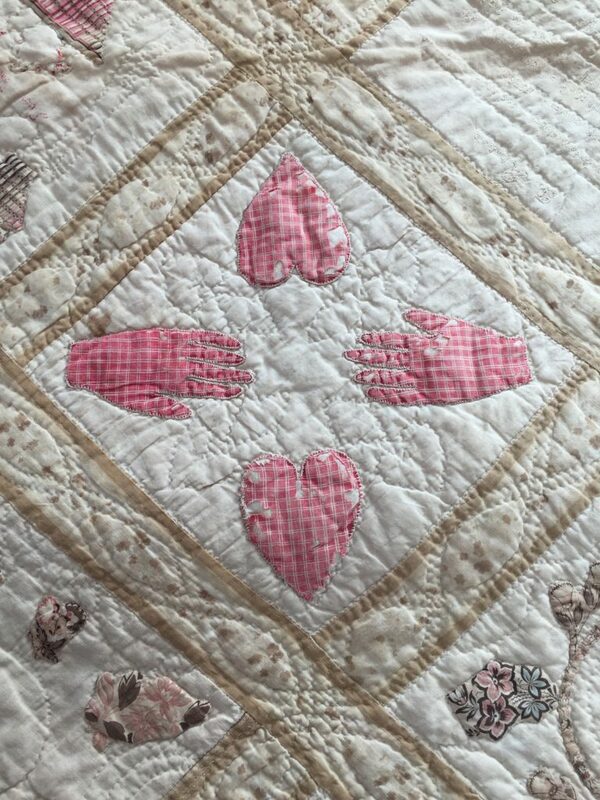 Makes me wonder if the quilt spent some time in an institution, maybe a nursing home. Please be in touch if you have more information about what these numbers might mean. Would make a wonderful quilt pattern.